Between Fedor Emelianenko’s abrupt quarterfinals exit, the UFC’s purchase of Strikeforce and the excessively long gap between opening round matchups, it’s tough to say anything in MMA has lost as much momentum as Strikeforce’s Heavyweight Grand Prix. Regardless, “Strikeforce: Overeem vs. Werdum” still goes down June 18th inside American Airlines Center in Dallas, Texas. Alistair Overeem faces Fabricio Werdum in the card’s featured attraction. 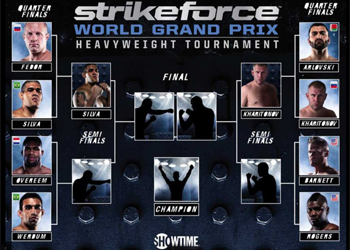 The heavyweights will meet in the opening round of Strikeforce’s tourney. Former UFC champion Josh Barnett will meet Brett Rogers in another quarterfinals matchup. Speaking of long overdue, Gina Carano will also make her eagerly anticipated return to the hexagon next month. The female face of MMA fights Sarah D’Alelio. Furthermore, Strikeforce announced Sunday they signed UFC veteran Jeff Monson to meet Daniel Cormier in a heavyweight showdown. Showtime will broadcast the main bouts beginning at 10PM ET/PT.